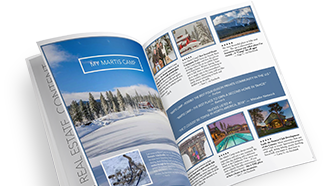 Our dedicated agents and support team are pleased to be a part of another record year at Martis Camp Realty. These efforts have produced sales volume numbers propelling Martis Camp Realty to the top producing brokerage by volume in the greater Truckee/Tahoe area for the second straight year. In addition to robust sales volume, 2017 has been marked by a record amount of snow fall and an epic ski season which translated into an equally amazing summer season, all fueling the demand for Martis Camp. As of November 17, 2017, Martis Camp Realty has sold or contracted 44 homes and 33 homesites since January 1, 2017, representing more than $238,000,000 in volume. These sales are a testament to the extraordinary custom homes that have been built along with the availability of premium homesites. As we look forward, we anticipate continued demand being met with a collection of awe inspiring custom homes and homesites. In addition to exceptional real estate opportunities, a key driving force will continue to be the year-round amenity package that only Martis Camp delivers. Our team at Martis Camp Realty is appreciative and proud to continue to lead the way with buyers and sellers within the community representing 69 of 77 Buyers and 72 of 77 Sellers in 2017. At Martis Camp Realty we take great pride in the relationships that are forged while working with clients to achieve their goals.